ZAGG Cover is a versatile Bluetooth keyboard for your iPad mini. The ZAGG Cover is one of the most versatile Bluetooth keyboards on the market. It features a unique hinge design that lets you position your screen at virtually any viewing angle. A clever design feature lets you reverse your screen converting the Cover into a convenient, one-piece reader or movie screen. When you’re ready to type again, simply flip your screen around and enjoy backlit, island-style keys. A powerful battery keeps the Cover going for up to six months of normal use before it needs to be charged. Package includes one ZAGG Cover Keyboard, one USB to micro USB charging cable, and a user's manual. 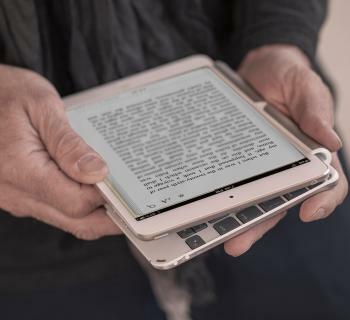 Featuring a unique hinge design that adjusts through 135 degrees, the Cover holds your iPad mini at whatever viewing angle is best for you, just like a laptop. The ZAGG Cover is thinner than other Bluetooth keyboards. Measuring only 6.3 millimeter, that’s barely more than a quarter inch, it will do more for your iPad mini, in less space. And while it’s thinner than the competition, it still provides up to 30% more typing space. 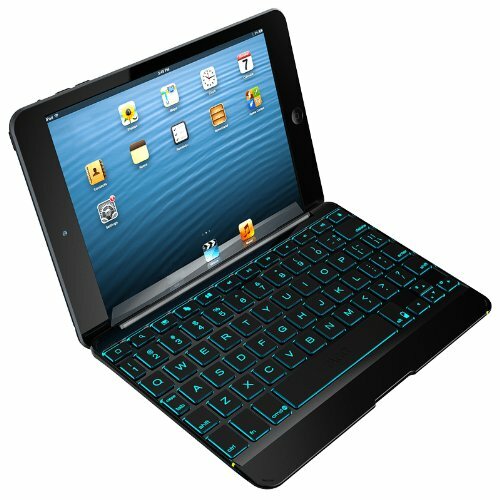 With backlit keys that can be customized in an array of colors and brightness, the ZAGG Cover makes typing in low-light situations a breeze. Plus, you get to have fun with your typing experience and make it yours. Ready to type? The Cover makes typing comfortable and easy. Ready to read, or watch a movie? The Cover also makes those activities easy. It also has a one-of-a-kind reading mode. Simply lock the Cover behind your mini and enjoy reading and watching bliss. When you’re ready for more typing, flip the keyboard around and you’re ready to go. The ZAGG Cover offers the roomiest island-style keys that feel just like a traditional keyboard, so you can type comfortably and naturally without sacrificing speed and accuracy. Its dedicated special function keys also work just like the ones you’re used to, so your fingers won’t even realize they aren’t typing on a laptop. The Cover comes with a long-lasting battery that can keep you going for up to six months of regular use between charges. In addition, cleverly placed magnets activate your mini’s sleep/wake function to help maintain that long-lasting battery life. Regular use is estimated at one hour per day. Using the backlit feature will impact battery life and may require more frequent charging.